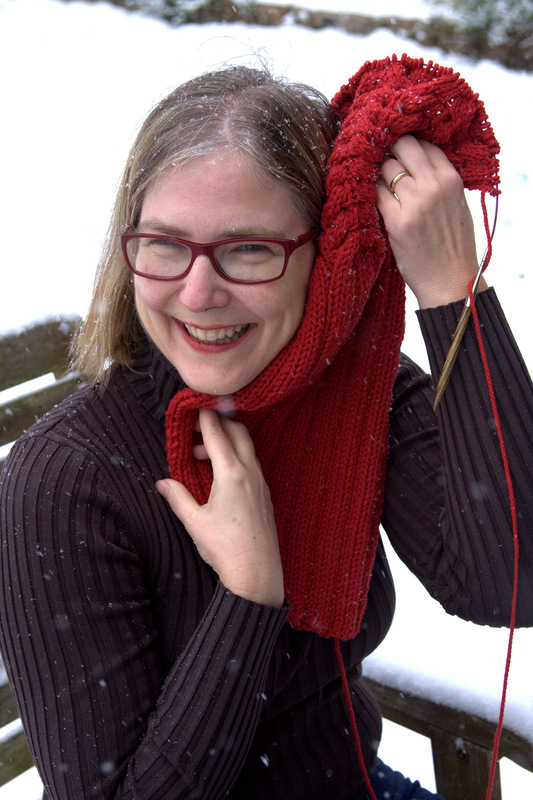 Sometimes I knit all by myself in a quiet spot with no interruptions and good lighting. I can spend that time doing things that take a fair bit of attention – doing intricate colourwork, picking up stitches, knitting lace or finishing work. Sometimes, I knit while holding a conversation, or watching a movie, or standing in line, or reading a book (yes, I can knit while reading a book). Sometimes, I knit in very poorly lit places where I have to rely on my fingers and not my eyes to know what I’m doing. Obviously, if I have two (or more) projects on the go, then I can tailor the project I pick up to the environment I’m knitting in. But it doesn’t stop there. 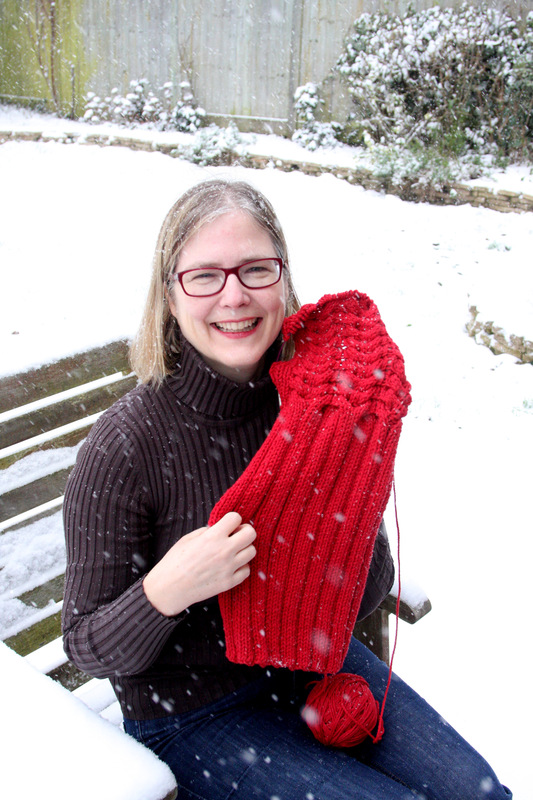 Often, I want to grab a project to knit on the run, but the project I’m working on is big and awkward and bulky. Some projects are more inherently mobile than others. Also, sometimes I feel like knitting lace on tiny needles and sometimes I feel like knitting miles of stockinette. 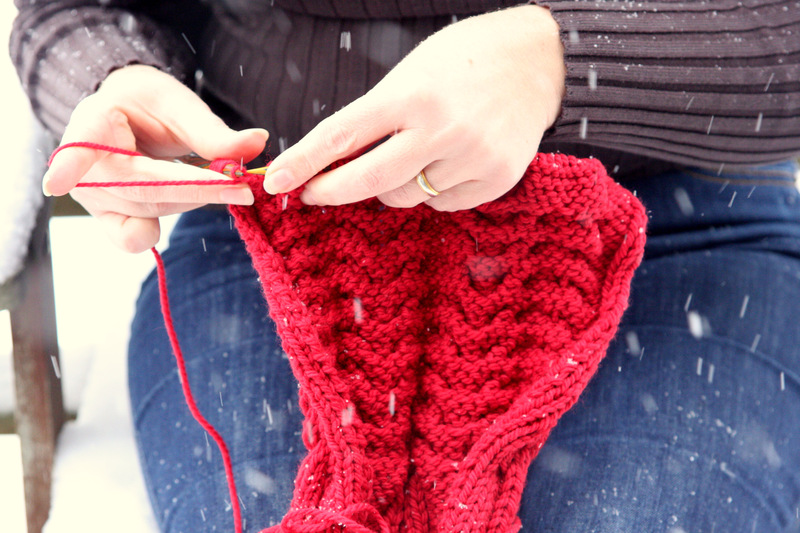 Then again, sometimes a girl needs just the right project to knit in the snow! 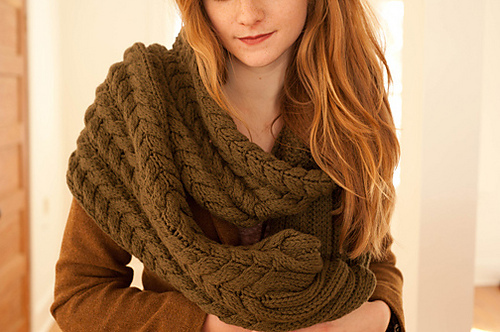 This is the February scarf, designed by Beth Weaver for Quince & Co Osprey. It is a giant scarf that you can wrap around your neck multiple times. It is knit in Quince & Co. Osprey, which is unbelievably lofty and squishy. Osprey is a chameleon – it looks completely ordinary in the skein, but when it’s knit up it transforms into something lovely and soft and airy. The best part is that it adheres to Kelly’s creative accounting formula: The yarn is already in my stash; therefore, I can knit this for free. This entry was posted in Main and tagged Beth Weaver, February scarf, Knitting, Quince & Co, Quince & Co Osprey by knitigatingcircumstances. Bookmark the permalink. Very nice! By the way, I couldn’t imagine monogamous knitting. I always have a few different projects going for exactly the reasons you gave. Happy knitting! I’ve tried monogamous knitting and crash and burned miserably! The more you knit, the more you realise that certain concepts and techniques transfer marvelously from one project to another, but they’re sometimes little and obscure details that you forget from project to project if you’re of the monogamous persuasion. That’s my excuse, and I’m sticking to it! The danger of knitting too many things at once is that projects are apt to fall from the radar. And that’s why I currently have a 4 year-old (beautiful) gray mohair sweater in the back of my car. It WAS hidden in the trunk of my former car, and when I recently bought my station-wagon, it’s now in the open hatch, and MOCKS me every time I put a load of groceries in. I don’t even know what needs to be done! I think I just need to check sleeve length and seam the whole thing, but it has been a while since I’ve fondled it. Have you ever seamed mohair? It’s a nightmare in the making! Why did I not knit this seamless, top-down and saved myself the agony? And so goes the argument for having many, many projects on the go at the same time. I wear my “knitting harlot” badge with pride. This comment made me think of this article: http://www.telegraph.co.uk/motoring/news/9596918/Clutter-in-the-boot-wastes-fuel.html, which claims that our fuel efficiency is bad because of all the junk we carry around in the boot of the car. It’s amazing, according to the article, how many of us cart around “unnecessary items” in the boot. Well, if I were to break down on the highway, I’d be most pleased to have a half finished grey mohair sweater in the back to work on while I waited for the tow truck.